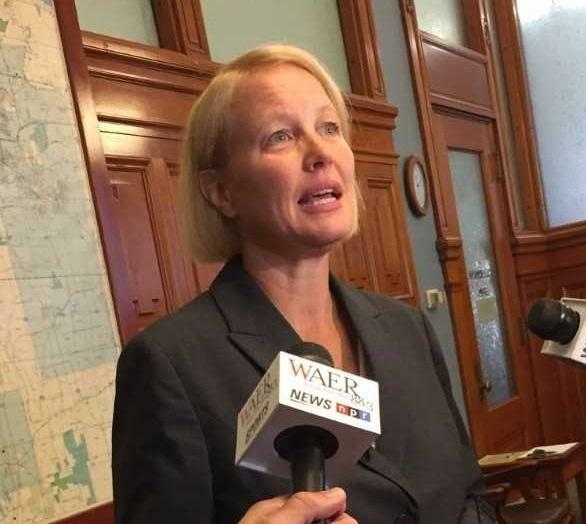 The Onondaga County Executive unveiled her proposed budget for 2018 to County Lawmakers today trimming the budget by $15 million over last year. She feels the $1.3 billion spending plan is a result of many factors including a significantly downsized staff of employees who take on more work. Mahoney is projecting $ 258 million in County sales tax revenue in 2018 which she estimates is $110,000 more than the County collects in property taxes. She explains that the county heavily relies on events at the year-old Lakeview Amphitheater and improvements to the State Fair to keep sales tax revenue strong which also impacts property taxes. She feels the county’s tax sharing agreement with the City of Syracuse could fade away within two years and heavily depends on the outcome of County Legislature races. Mahoney claims that she’s heard of an internal political effort to support candidates who would be against sharing further revenue agreements with the city. She encourages voters to ask County Legislature candidates if they support sharing sales tax revenue with the City to make an informed choice. Mahoney points out that many residents who live in the suburbs work at non-profits in the city which are exempt from property taxes, so they benefit and she feels giving back to the city is essential. She says the City collects $34 million in property taxes and receives $75 million in unrestricted state aid for operations and $85 million in county sales tax revenue. Mahoney says if the county’s share was taken away from the city, it would be as though its entire property tax levy would dissolve.